It seems every sign of encouragement here in Burundi has a 'but' attached. One of the things I have noticed during this trip, which has taken me to some parts of the society that I hadn't experienced before, is that there is at least a part of the society which is making enough money to begin to build some rather nice homes. These would be nice homes even by Western standards, thanks to low constructions costs and the wonderful climate, which means you can easily have a beautiful tropical garden with your home. Multiple story homes, with huge tropical plants and trees. Luscious lawns and beautiful landscapes are commonplace in a few parts of the city. But even in these havens, there are cold, harsh reminders of the buts. "That came with the war." He was speaking of the armed conflict that tore the country apart between 1993 and 2005, a continuation of years of conflict based largely on ethnic tensions between the Hutu and Tutsi, but manipulated by political leaders seeking power. The conflict sent neighbors into rival factions, attacking one another and fleeing from one part of town to another as they began to distrust their neighbors. Neighborhoods that once had been mixed became havens for one ethic group or the other. And a way of life changed, perhaps forever, Emmanuel told me. 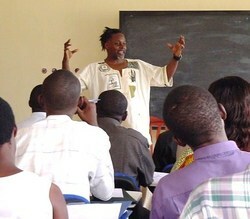 Walls were not a part of Burundi culture traditionally, he said. It used to be you shared your yard with your neighbors. There was perhaps a hedge or something to mark your land. But it was open. You could see each other and talk to one another." "But with the war, not only did we get the walls, but the walls are now the first thing you build. That is what you build even before you start building the home." A feature of the war was a sort of ethnic cleansing of neighborhoods and villages. So, one always feared that their neighbors or groups from the opposing ethnic group might come and chase them from their homes at best, or slaughter them at worst. Thousands of people lost their homes and the courts are still sorting through property disputes from before the conflict. In a country where a man's home is his status, this is huge. So, the construction reflex is now defense first. "I don't think people are even thinking anymore when they build the walls," Emmanuel said. "It's not that they are afraid about another war or that they are thinking about it. It's just what you do now. "I don't think that will change for a long, long time," he said. He conceded that not too far down in everyone's psyche, however, is the knowledge that the peace they have known for three years now, the peace that is allowing them to build and enjoy life again, that that peace is a fragile one. Those barbed wires are certainly prickly reminders of that reality. Speaking of health care, the subject came up as Olivier took me around the city yesterday. Burundi's health care plan is perhaps one that pure capitalists would dream of. No government run program here. Everyone pulls his or her own weight. "There is no insurance here," Olivier explained. "There's no public insurance, and no private insurance. "When you get sick, you pay what it costs. If you can't pay for medicine, then you don't get the medicine. "If you go to the hospital, they will treat you, but if you can't pay when they have finished, you can't leave. You have people who are still in the hospital months after they are healthy," he explained, noting that the hospital for these debtors becomes like a prison until they can pay. Don't worry, you soft liberals, there is mercy in the culture if not in the system. "When people truly are unable to pay, someone eventually intervenes," Olivier said. "Either family or church will come up with the money eventually. "Sometimes the president de la Republique will personally intervene on someone's behalf." Oh no! They just ruined a perfectly good health-care plan with government meddling! If we get rid of that part perhaps we will have the perfect counter proposal to Obamacare! Obviously, I am being sarcastic, we have already talked about some of my thoughts on the health-care issue, but I would think that America as a nation with considerably more resources than Burundi can come up with something -- if reasonable people decide to really look for solutions -- between death panels and debtors prisons. I noticed it yesterday, and seem to recall thinking a bit about it last time I was here. But today some new Burundian friends confirmed it for me. The background music that plays in most coffee shops and meeting places here is not traditional Burundian music, nor is it modern African music or R&B from the States, as is the case in other African nations I know of. Here, you are more likely to hear the smooth sounds of Kenny Rogers or Hank Williams Jr. or Dolly Parton playing. I couldn't help but point this out to Olivier, who was showing me all around the city and introducing me to people he knows through his business ventures. He and his wife Francine had taken me to a nice beachfront area of Lake Tangianika to have a bite to eat. And again I heard the familiar sounds of country classics. 'You know it is funny hearing this music here because practically only white people listen to it in the States," I said. Olivier said he likes the music because it is calm and soothing. I explained that it is not so much that Blacks in the States don't like the music, but that it is probably associated with unpleasant memories for black people collectively. Later, Delphine, his 31-year-old neighbor who lived in France for three years before moving back to Burundi with her French husband, continued the discussion with me. "My father had all those albums when I was growing up," she said. "It's like the old classic standards to us. We all know them." Olivier and Francine nodded their heads with smiles that suggested they had checked out to memory lane. "We don't have the same history that you guys have with this music," she said. "For us, the memories are good ones. Perhaps for you guys you can't appreciate the music because of your history." I had never thought of it before, but perhaps she is on to something. I know that many southern and rural blacks do like country music. At least the old stuff. But still, it was the last thing I expected to find here. 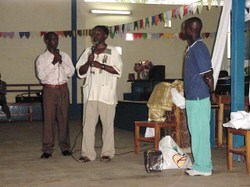 What does health care have to do with repentance and Burundi? By the way, the American health-care reform debate may not seem like a subject for this blog on reconciliation. And it may seem strange for me to talk about it during my trip to Burundi. But remember, reconciliation happens when forgiveness meets repentance. And, very little is understood about repentance, I have discovered. Not here in Burundi, not in France and not in my home country of the United States. One aspect we hope to talk more about is the desire, when one truly repents and begins to be restored, to make things right. Even more is a desire to reject core thoughts that we hold or that have been held by our group or even our predecessors once we realize that these thoughts go against truth and justice. Well, even in something like health-care reform we can see some of the signs of thinking that disciples may want to reconsider. If you are in Christian circles in America you may not get a chance to hear differing thoughts on this and other debates, which can give the impression that there is only one, true Christian way to think about this. Here are some others that you can add to your sources of reflection. Brian McClaren writes many things I have been wanting to say in his Open Letter to US Conservative Christians. You should also check out what Jim Wallis has to say on the subject. McClaren also lists several faith-based fact-checking sites. I, for one, would like to challenge all Christians to not forward ANY e-mail they receive that speaks of politics without first checking to see if the source is credible. People of faith (any faith) are easy marks for those who are looking to exploit the word-of-mouth machine. We tend to believe what we hear automatically when it comes from someone we think is like us. Politicians, interest groups and corporations have long figured this out and some lobbying groups have come to specialize in preparing factless campaigns focused on conservative Christians. So all they need to do is get a Christian to forward their "facts" and it becomes automatically credible to the other Christians who will receive it. Disciples need to be wise and not allow themselves, no matter what their political beliefs, to be used like this. The results can be more important than we think. Here in Burundi, like in neighboring Rwanda, an overwhelming percentage of the population was Christian. But their faith did not lead them to repent of cultural ideas that had been handed to them through colonial rule and their own ancestors. And when pushed to the edge, it was their beliefs in their own group superiority and need for vengeance and self-protection against the enemy that led to genocide in Rwanda and 11 years of ethnic violence in Burundi. All of this happened with churches participation at worst and silence at best. And the result has been a young population that, while it has not turned away from the church in droves, is increasingly questioning the foundations of this faith that was not able to keep people from acting out of their worst nature. When I watch the town-hall anger and read some of the hateful comments that I have come across on facebook and blogs (my wife was privy to some message strings on Obama and health care from some of her high school friends on Facebook recently that would make you think twice -- no, thrice -- about how far we have come on race relations in the US), I sometimes wonder what is possible in America. Are we so far removed from the people who took out machetes and whacked their neighbors when they felt threatened? Are we really that different? I would argue that we are not different at all. The only thing that protects us is what core beliefs we allow to govern us. And right now, I am not sure that those core beliefs are in order. After a long journey that included a canceled flight and a two-hour 'night' in a hotel in Nairobi, I have finally made it back to Bujumbura, Burundi. Can't say much now because I am using someone's computer quickly and we have to move on, but wanted to let you know I was here and to encourage you to check in for updates during my two-week stay. Unlike previous visits I don't have conferences or seminars planned. The goal is to meet with people to talk about the process of reconciliation in this nation traumatized by ethnic conflict and still staggering under the weight of crushing poverty. I was encouraged to find an open person next to me on my morning flight from Nairobi today, a flight that wouldn't have taken place had an airport strike Sunday not caused my flight to be canceled. I had a great and very candid talk with this young woman who seemed to have an excellent grasp of the principles of forgiveness. I asked her if she was a student. She smiled and told me who she was. She is a senior advisor to the president of Burundi, in charge of protocol. I'm always amazed at the youth of the people in positions of authority and influence in this country. Anyway, who knows what will come of this latest contact. Just one of those little winks that convinces me i'm not alone. Since then, I was able to hook up with Claude Nikondeha, whom I have known from a distance for years since being introduced by Brian McClaren. Claude, an advocate for the poor, is behind Amahoro, an organization that seeks to develop church leaders who can break out of convention and effectively live oiut faith in ways that engage today's world. We really click and think in many of the same ways about faith and life. Claude introduced me to several friends, including one whose organization Help Channel is exactly the kind of homegrown effort that we are looking to learn from and walk with. I will be meeting up some more with Cassien later this week. It's nice to be back here again. It is hard not to like the people here and the simple way of life. But one can feel the changes and the development that are happening here as the country slowly emerges and begins to taste the fruit of the peace it has maintained now for several years after 11 years of bloody conflict. Not all of the changes are positive, though. One can sense the desire for the Western lifestyle that is so attractive and yet so destructive ultimately to the long-term development of countries like this. When people are not used to hoping in their future, seeking rewards now becomes the sole driving force. Though many fiscal conservatives think that greed motivation is a good thing, it actually leads people to actions that will ultimately ruin true, healthy development in this society. More on that later, but people like Claude are seeing the results of this short-term motivation and how it threatens the solid development efforts that people here have put in place for themselves. Today we started the seminar with reports from each small group about the ideas they had been given through society, family, experience, etc., concerning the relative value of their group when compared with others. I had expected the discussion to be a bit tense, with the backdrop of Hutu and Tutsi conflicts dating back decades. But what ended up dominating today's discussion was something different entirely. 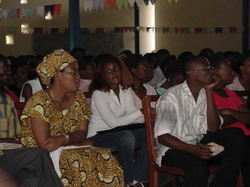 Here are many of the people who attended the Reconciled seminar. Women are a distinct minority in the seminar; there are only four here among the 50 or 60 who have shown up so far. But on this day, they had a lot to say. One of the questions the small groups considered was the messages they had received concerning their gender in relation to the other. Across the board it was confirmed that the value of women was considerably inferior to that of men. They shared many examples. And this is where things got interesting. Because they were asked not only to cite the messages they had received, but then they were asked to cite God's opinion on the matter to see whether the two jibed. We had already talked about Jesus's repeated affirmation in Scripture that we were were to love our neighbor as ourselves, meaning that we had to put our neighbor on the same level of worthiness as ourselves. But then they mentioned other Scripture, in particular Galatians 3:28-29. And then, as if to make sure that it was understood that loving our neighbors as ourselves included wives, they cited Ephesians 5:27-29. So is it possible to love God as Jesus said while not considering our neighbors (women and men, Hutu and Tutsi) as equal to ourselves? It was agreed that the answer to that question was no, but many began then to talk about other passages. It was one woman in particular who asked about the idea of women submitting to men. Didn't that suggest that men were of greater value? She wasn't arguing for women' rights, she was simply trying to wrestle with different ideas she had received. Another woman asked about a wife who is beaten by her husband. Did she have to stay in that marriage in forgiveness even if the husband continued to beat her? Of course I came into this with my Western mindset, and I wanted to be careful not to impose my cultural thinking on their situation. The Bridge beleives that the key to our work is encouraging local people to develop models for peace and development that fit their culture. We wanted to stick to the broad ideals and let them work out the applications for their own culture. But we did ask one question: "Is it possible for a man to beat his wife day after day and still consider her equal in value to himself? Is it possible that he can do that and still follow the principle to love her as he loves his own body?" "If not, then it seems we have a choice to make: Do we follow what our culture says or do we believe what Scripture has said? I don't have the answer for you. 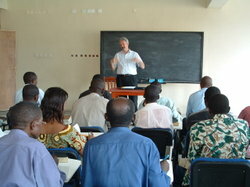 It's up to you guys to figure out how to follow Truth in Burundi. I have to do it in Paris and the United States." It was a great example of the challenges that we face in the business of reconciliation. We need to repent from false ideas that affirm inequality if we are to have any hope of the forgiveness and repentance needed to see groups reconciled. And those of us from the West, though perhaps more subtle and sophisticated in the way we talk about it (or not talk about it) still do not see women as completely equal. We still have received notions about women from past generations that go against the general truth of equality. Burundians are not alone in their need to repent from these past notions. And we have little to say to them if we are not willing to look into our own hearts and turn from notions and actions that work to keep women in a second-class status. I was encouraged to see that there was not major opposition coming from the young men that made up the majority of those in attendance. Most of the young men affirmed the value of their sisters, and nodded in agreement that when it was suggested that much needed to change. One young brother and sister from the Congo later invited me to address their Congolese student group on campus on the women's rights subject. My schedule won't allow it, but I was encouraged to see the desire of young people to move to another place. That bodes well for the possibility for reconciliation in this country and in this region. There is a generation in Burundi and Rwanda and Congo and elsewhere in this war-gutted region who have seen what the status quo has brought them. It has destroyed their past an it threatens their future. They don't see holding onto the flaws of tradition as a quaint luxury. They know that it is vital that they root out the flaws in their tradition and redeem them with traditions based in equality, love and respect. Today, I saw hopeful signs that men and women, Hutu and Tutsi, Europeans and Africans ... can come together to make some progress. "God's sun travels over the entire world, but it sleeps in Rwanda." So goes a Rwandan proverb shared by a brother during a group exercise during the debut of the version française of the Reconciled Seminar this afternoon. 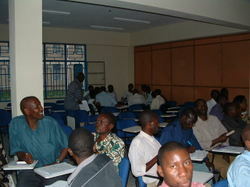 On this first of three days with about 60 students enrolled in the seminar at Hope of Africa University in Bujumbura, we were able to cover the basics of reconciliation and finished with a group exercise in which participants listed ideas about their own value and the value of their people that they had received from various sources. Here is the illustration about the wall of mistrust, pain, etc. that separates people on the two sides of conflict, making it virtually impossible to settle an issue by going directly to our adversary. We were simply trying to get an idea of the types of ideas we had all received from our infancy about ourselves and others. It was interesting to hear the list of things that they all had heard. It got tense at times when some people started to mention "the arrogance of the Tutsis" or "the jealousy of the Hutus," but this group of people understood that the point was not to say whether or not they agreed with the ideas, but that this is what had been given to them. We also began to touch on the idea of the relative value given to men and women at this point. Tomorrow, we'll go into depth about the results of all of this conditioning. The basic idea is that we need to realize what we've received so that we can compare it to "truth" and reject it if necessary. Much of what we were hearing in this discussion is going to have to go, if our standard of truth is Jesus's teaching on equality. We saw clearly that not all of what we receive from society, even our own group, casts us as superior to others. One idea that came up in all three groups was the inferiority that they all had learned when confronted with white people. Though intellectually they knew and wanted to believe in their equality to Europeans, everything about their history, and their present for that matter, confirmed the belief that they were inferior. Collegue Steve Thrall had an interesting role as the only white person participating in the week's activities. Not only that, but even among their own culture and families, sentences about blacks as opposed to whites are laced with self criticism and even self hatred. It was interesting to share with them that I had had pretty much the same exprience as a black American. Often, the worst things I ever heard said about black people came from black lips. And, I have learned over the years, that many of those ideas remain in my mind and have taken the form of shame in my own life. So, imagine the difficulty of trying to deal with forgiveness and needing to feel equal to someone who has wronged me or my people when I already feel inferior to that person. See the challenge? We'll see where this goes tomorrow. After a day of talking and planning, today we got busy on our first day of teaching. The last time I was here in Bujumbura we were talking mostly about the need for inner healing as we seek to be reconciled with others. We can't be reconciled with others, we stressed, unless we are first reconciled with ourselves, and with God. We ended up focusing mainly on forgiveness even though we all agreed that reconciliation happens when forgiveness meets repentance. We left Burundi with a conviction that we had to better understand repentance if we were going to be of any usefulness in this country? For more than a year we worked on coming up with a way to teach the two sides of reconciliation so that they could be easily understood, and much more importantly, in a way that would give people practical tools for putting the principles into action. We brought it all together into what we hoped would be a useful tool, first trying it out on a trip to the States in January at a small church in Kent, Ohio. But now it was game time. The real deal. We were no longer talking to people about forgiving their mother for not coming to their high school basketball game. We were talking about war. Killing and maiming of parents and children alike. As we stood in the chapel of Hope of Africa University and listened to students sing worship songs for their weekly devotional service at the Christian University, I was overwhelmed with the feeling that I had no right to be speaking to these young men and women. By what right did I come to teach them something about reconciliation. One of the young students helps out in our reconciliation illustration. Had I been through the trauma of 11 years of ethnic fighting and civil war? Had I had members of my family killed, as I was assured was the case for almost EVERYONE in attendance? Had I been asked to forgive the people who had brutally murdered or injured me or my loved ones, watching them walk around freely in my neighborhood or in my school or in my workplace? What did I know about forgiving like that? As the singing went on, people continued to pour in from the rain and mud outside to join the service until there were about 500 in attendance. Here's a picture of some of the crowd. Below is another shot from the back of the room. It seemed like more people than the last time I was here. This was possibly the largest crowd I had ever addressed in my life, in fact.It had been a long time since I felt this nervous before speaking. "If you've got the words, then just say the words," an older woman at a black church in the States told me a few years ago. "Don't worry about what they gonna think. Just say the words. "And then live the words." So I said the words I had. They weren't mine anyway. These words had come from people like them. People who had suffered and forgiven. People who had hated and loved. People who had been treated like the scum of the earth but who had chosen to inherit it through peace rather than striking out in vengeance. When I finished, I wasn't sure whether the words had struck home or not. 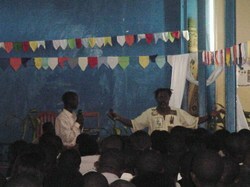 Especially since I was speaking in French and then being translated into English by a young Burundian named Alliance. But afterward, the response was extremely positive. People seemed to connect with the image of the scales that we used to illustrate how both sides in a conflict have a built-in need to keep their God-given value. And in the end, people here -- especially the young -- seem hungry for peace. When it was over, several people came up to me and began talking about the need to keep sharing this message here. And they had only heard Part 1. On Friday we'll be coming back for the repentance side of the discussion. "We are ready to do what it takes to get past this place," Alliance told me later. "We've had enough of this. It may be hard to forgive, but we have no choice." I guess we'll just keep saying the words. Pray for us all to be able to live them. woke up to go to the bathroom (stomach is better, thank you). music is pumping from the nightclub nearby. techno type beat. then i heard an interesting, arabic type mix in the music. it sounded like they had mixed in à muslim call to prayer with this music. then i realized it was à muslim càll to prayer. it was 4 something. one of the times for faithful muslims to wake up and pray. that was on the south side of the catholic hospitality house where i'm staying. and on the north side was pumping techno. strangely, it actually sounded cool together. there's some image or spiritual message i should be pulling from this i guess. but give me à break, it's 5 in the morning. Another difference between last time and this: Last time I ate and drink everything with no intestinal problems. This time I started getting a bit gurgly on Thursday and then had a full-fledged problem on Friday. Thankfully I was able to finish part 2 of the morning chapel message, where there was a packed house of probably 400 to 500 students. I would later learn in a discussion with a young man from Congo that at least a portion of the people were there to see the Rastaman preacher. Word was starting to get around that there was a guy with dread locks who was a pastor. Apparently this doesn't compute in most people's minds here. How can a man of God have such a fleshly appearance? It's interesting, I told the young man, because for months leading up to the trip I considered cutting all my hair off so that it wouldn't become an obstacle to the message being heard. ''No!'' he said. ''It's very important for us to see this. It's exactly what we're talking about in the seminar. ''We're so used to judging people based on our culture and traditions rather than seeing that everyone has value that comes from God. So my hair has become a sort of object lesson on our need to reject the human tendency to judge everyone's value based on our culture's definition of value rather than accepting the inherent value of every human being. This has truly been an amazing time. I would never have guessed the message would be this well received. So far we've been invited by five different people to go to the Congo, two from Kenya and one from Rwanda to do the same teaching in those places. We want to focus on having a real impact here in Burundi first, but it is encouraging to see the hunger for a way toward peace. Today, we finished up the seminar had some excellent and powerful moments as people brought forward sheets of paper on which were written the names of people they have been reluctant to forgive. We sang as the names were covered in a red cloth signifying the blood of Christ and then covered by a white cloth signifying his purity and forgiveness. The singing went on and on and people were obviously touching a new place. Several told me so afterward. One young man talked about how his family was held hostage for a month during the war here, and how he watched his father be tortured for days. Others spoke of watching people be killed. Others spoke of the daily stress of going to shop in an area held by the other tribe and having to lie about their origins in order to get food. And then living in terror that they would be found out and killed. Hopefully we are going to see some progress toward healing some of those wounds and assuring that this doesn't happen again.